Imagine if by focusing in on changing just a couple of words in your every day communications with your team, colleagues and customers, you could have more influence and impact and achieve improved results. The fact of the matter is … you can! From the moment we learn to talk, we influence our environment, those around us and our outcomes through the power of our words. We use words to express our joy, fear, happiness, anger, frustrations and our deepest desires. The words we use have the power to inspire and motivate or discourage and debilitate. So let me make a little confession here… I am a bit of a stickler for the words we use. Not because I am any sort of a wordsmith or have a Masters in English Literature, but because I have seen the impact our choice of words has on the effectiveness of our communication and also on how we feel. Most of us, most of the time are not aware of the words we use. I have more than once interrupted a conversation with a client to highlight disempowering language and provide guidance to find a more empowering way to express the thought or idea. One client put it most eloquently for me. Changing the words she uses on a regularly basics (and eliminating others) has “changed the colour of my world.” The way she expresses herself now is empowering and inclusive. She has improved her interactions with her team and improved communication skills and relationships has contributed to recent outstanding sales results. 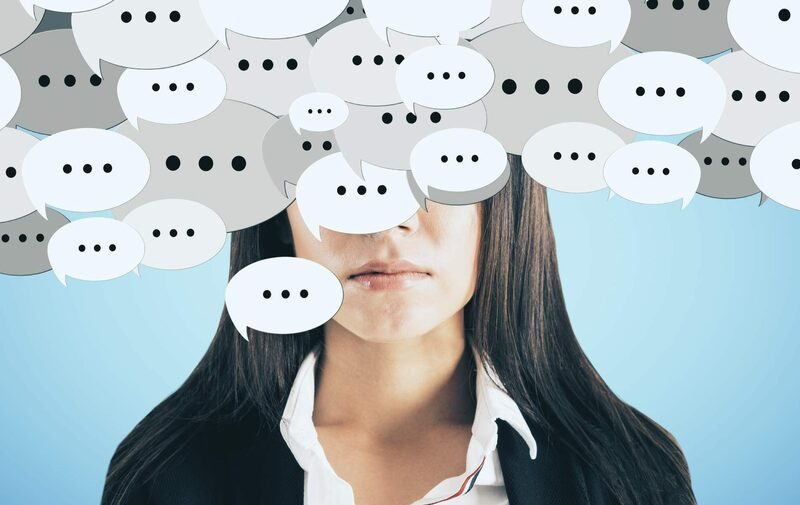 Our gift of language is a bit like breathing … most of the time what we say to ourselves and to others is unconscious and we are completely oblivious to how our words affect us. Many of the words we use come with an emotional charge. When we use words stacked with negative emotions we trigger a physiological flight or fight response. This response was designed to help us flee from the scary wild beast… not manage the everyday trials and tribulations of the modern work environment. Here are 5 words that come with an emotional charge and are worth avoiding. Eliminate these words… and notice the difference in how you feel and the response you receive from those around you. 1. I’m Overwhelmed – Think for a moment how you feel when you say something like “I feel overwhelmed.” There is a sense of hopelessness and impossibility. Now imagine replacing the word overwhelmed with “I’m a bit busy” or “I have a challenging schedule” or “I am prioritising a heavy work load right now.” The energy around the statement is lighter and it is filled with more possibly. 2. I’m Angry – To say we are “angry” about a situation such as an error made by one of your team or a missed timeline on a project brings with it an emotional intensity. Sometimes it is warranted and productive but most of the time to language the emotion we are feeling as anger will only heighten the emotion and could in fact intensify the situation. Now imagine changing the description of your emotion to “being annoyed” “disappointed” or “frustrated.” It doesn’t mean that you don’t feel angry but by changing the word you will minimise the intensity of the situation, giving you more chance of achieving an amicable resolution. 3. It’s Hard – When we say something is hard, it gives the impression that it is almost impossible to achieve. When we replace it with the word “challenging” it gives the task or situation a greater sense of possibility and even a sense of excitement. 5. I’m OK – when someone asks you how are you doing, instead of saying “fine” or “OK”, ramp up the emotional dial and say something like “I feel fabulous” or “I’m sensational!” As simplistic as this sounds, it creates a new pattern in your neurology and you will receive a quick injection of happy hormones. Now it is your turn. What words do you use on a consistent basis which are disempowering or negatively impact your emotions? If you don’t like the results you are getting, take a look at the words you are using and choose to be more selective. Choose to select words that empower you and engage others. Break old patterns and create new resourceful patterns that help you manage your emotions and have you noticed as a powerful communicator.